Today’s Think Write Thursday topic is to write about three good things that happened this week. 1. I had not one but two playdates with Charlie. Tuesday afternoon I picked him up from school and we went out for frozen yogurt before heading home to play with Sam and Katie. I stayed through bedtime – always a treat – and then enjoyed a delicious dinner and some good girl-talk with Katie. This morning, we went to the park and then out for pizza. I’m really happy one of the guys in my life loves pizza as much as I do! 2. I also met up with friends two times for knitting. Our Monday afternoon group is coming together nicely, and it helps to have a common project. My shawl is bottom left – all the way done with clue 4, so I used the time to finish up the second sleeve on Tide Chart (aka the “four week sweater“). 3. And thanks to that, and a little more time on Tuesday morning, Tide Chart is done and blocked! We all know that focus on the GOOD is GOOD for us so let’s do it! Head on over to Carole’s blog to share your GOOD this week! oh yay for a finish!! And, those shawls!! Lovely! Two playdates with Charlie, five mystery shawls (love that pink and purple one!) and one finished sweater >> just three good things. Thanks for sharing so many with us! Hooray for a good week! I'm glad you had some fun with Charlie and some great knitting time, too! 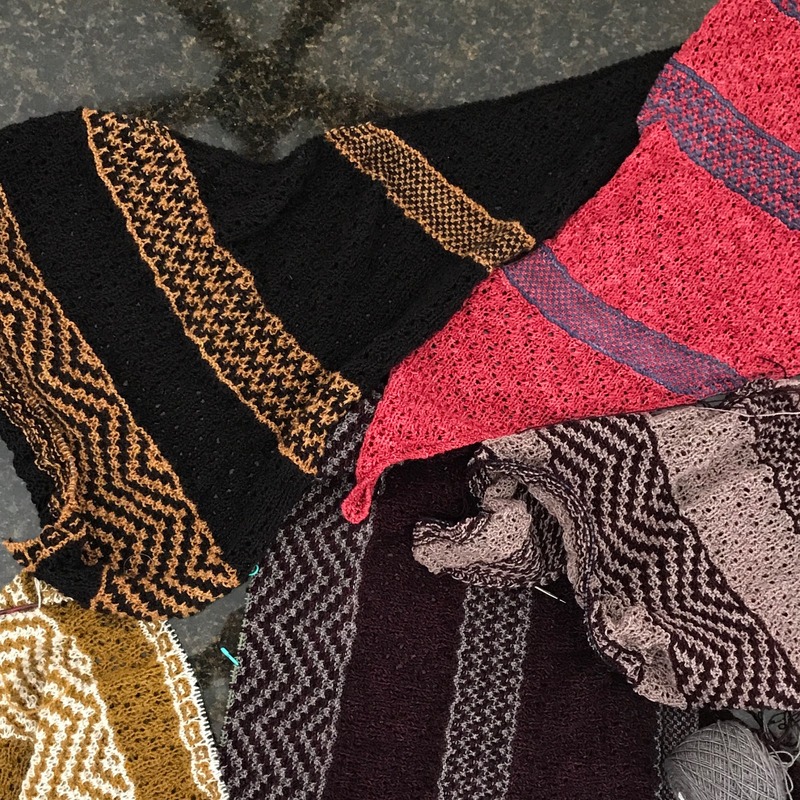 Your shawl(s) have been the driving force behind my desire to knit TTLM. They're beautiful! I'm so impressed with the amount of knitting you do in a week, plus all the fun you have with family and friends! Your sweater looks great…the shawls are all gorgeous…and is that a Star on Charlie's nose??? Too funny. Here's to what has been a great week and cheers to an even better weekend — enjoy!! Congratulations a finished sweater! It looks great! thank you! I'll admit I haven't tried on the finished version … it's been too hot! Very good things, indeed! Especially Charlie 2 x this week…I love the star on his nose! Your jumper looks very stylish – not long now till autumn :). How lovely to be able to see Charlie so much. You always look so happy together.